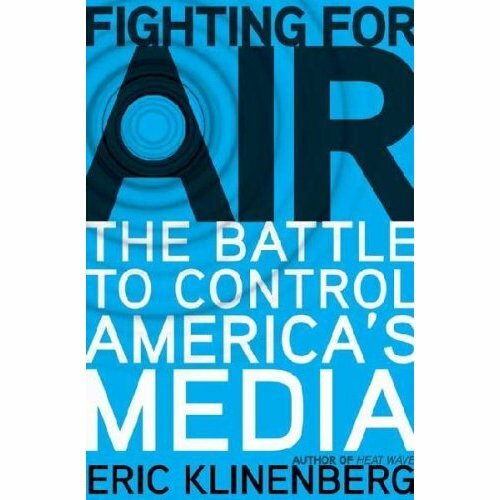 I just finished reading Fighting for Air by Eric Klinenberg. It is a good book and a great discription of what has happened to radio since the major consolidations occured in 1999 and 2000. Depressing. Just damn depressing is what it is. The book chronicles the evolution of the Prophet System and how that system was used to replace entire radio station air staffs. It discusses the various failures that radio has produced as a result of automated programming, the complete lack of originality, public safety issues and how major media companies have stripped the heart and soul out of radio. Something that the book points out that I never really considered, every one of these unoriginal canned music stations diminishes all radio by some increment. For those that think the Clear Channels, Cumulus and Citadels are only harming themselves, think again. People who get fed up with radio and buy an I-pod are excluding all radio stations from then on. That is another degree of audience lost to a competing medium. Having worked for one of the smaller group owners since 1999, one that rarely if ever appears on anyone’s radar, I can say I have seen some minor shades of what has happened with Clear Channel in the company I work for. I think everyone who works in radio has seen some of this in one form or another no matter who they work for. Radio has never been the most stable of employers. Even in the early days, people moved in and out of radio stations, sometimes taking a job with the competitor across town and sometimes moving across country. It was understood that sometimes changes needed to be made, sometimes people had to be let go. It was a part of the landscape. The difference is in the post consolidation radio environment, people are leaving radio altogether, replaced by a mindless computer programmed from afar. During my time as a radio engineer, I have installed a few of these computer automation systems. I think the first one was in 1993 on an AM station doing all news. We used it for the overnight hours, replacing some minimum wage board operators. The general manager was shocked and a little bit in awe of how well the system worked. This trend continued in 1994, when I installed a BE Audiovault system at an AM/FM combo. There again, the system replaced an overnight board operator on the AM station. Later, the FM station did a sort of mini-mation where the overnight news guy checked on it every 45-50 minutes. Those stations are now completely voice tracked and or satellite syndicated. Through the 90’s, I installed first generation computer based automation systems mostly on AM stations. Things like Digilink, DCS, ENCO, etc. In other markets, an automation system was used to resurrect a couple of FM stations, starting out voice tracked, then adding live bodies to fill in day parts, usually having the 6 pm to 6 am time slot voice tracked. Having three day parts live is better than none I suppose. The AM stations in my market cluster now are running some awful syndicated satellite news/talk programming. Why are these stations even on the air? They should be sold to someone who will operate them locally, or turn their licenses in. For whatever roll I have played in ruining radio, I am sorry for it. It is a good book, I recommend anybody that works in the radio business read it.